First RR to Spanish Fort, from station at No. 9 Basin Street, corner Basin & Canal. Schedule first appeared Oct. 3, 1875 (N. O. Times). (Actually, in October of 1866, Mr. P. M. Ladire and H. S. Fulkerson, organizers of the Carondelet Canal & Navigation Co., also planned a RR to Spanish Fort.) Extensive news in T-TD as to equipment. Road used Remington's Baxter patent steam engine, two delivered, with unknown number of cars, all presumably Remington products, Ilion, N. Y., of unusual design: platform at only one end of each coach! At first sight, an obviously dangerous innovation (see sketch below). The road failed quickly, in 1876, after one Remington motor wrecked. SS 7/28/1876 mentioned the ff eqpt. (some rolling stock and property already sold): “One Remington passenger steam dummy car, two passenger cars nos. 1 and 11, and one open passenger car” (see sketch of 2-car train — sadly, no P discovered). At least one type of odd (and dangerous) car ws bought by the New Orleans City RR at the sheriff's sale, or perhaps just before. See New Orleans City RR, page d4. Sketch of Remington noiseless motor and one-platform cars, assuming cars are DT AR; 22-25' OB, 18-20 cross seats. Courts assigned James A. Shakespeare (a future mayor of N. O.) as receiver (T 11/3/1876). The road's original president, Mr. Thomas H. Handy, took control on July 14, 1877 and began inproving the RR, buying Porter locomotives; no listing of new passenger cars. 298 4/78 B-2-S-M 8x16+36 2-4-0T 62½" 10T Three of the Porters were named, “T. H. Handy”, “W. H. Bell”, and “Geo. F. Brott”. Which loco had which name is unknown. Disp. unknown, but poss. sold to N. O. City & Lake RR Co.
299 " " " " " "
312 7/78 " " " " "
313 5/79 " " " " "
364 3/80 B-2-S-M 8x16+36 2-4-0T 62½" — Sold to Union Pacific and RG to 36" circa 1904, RG by UP in 1906. Disp. unk., poss. to N. O. City & Lake RR Co.
Porter, Bell locomotive number 2 for the Canal Street City Park & Lake RR Co. We see a “dummy” car, i.e., a loco hidden within a streetcar-like body, with a horizontal boiler, a funnel smoke stack, a locomotive-type bell on the front platform, a huge cowcatcher, and a single step at the rear such as would be found on a bobtail horsecar. The loco appears to be posed on wooden rails. 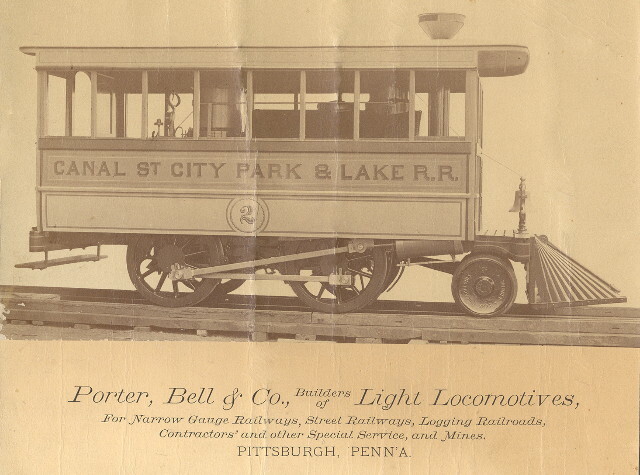 The picture must have been created as advertising for the Porter, Bell Co., as witness the caption below, which reads, “Porter, Bell & Co., Builders of Light Locomotives, For Narrow Gauge Railways, Street Railways, Logging Railroads, Contractors' and other Special Service, and Mines. Pittsburgh, Penn'a.” The original picture, probably a builder's photo and now over 130 years old, has been folded over some time in its past. This display has been retouched somewhat to improve the appearance without obscuring further any of the features of the locomotive. The new RR had an early close financial connection with the British-owned Queen & Crescent Route, which entered New Orleans via its subsidiary the New Orleans & Northeastern RR. The NO&NE RR Co. entered New Orleans November 1, 1883. It was a 5' gauge railroad, converting to standard gauge (4'8½") on April 8, 1886 (Poors,, 1889). John Scott, Esq., the NOSF&L RR President, announced his intention to merge the RR with the NO&NE RR (DP 5/3/1882). Improved, the RR owned a steamer “Harry Shannon” that plied between Spanish Fort and West End (DP 6/19/1885). The Daily Picayune commented 3/28/1886 that “the road [is] in fine condition”, coaches painted “Indian red on outside, bright buff interior with sky blue ceilings”, with cane or wooden seats. Three locos repaired (poss. the original Porters regauged to 4'8½") and new 50 lb. rails laid. These improvements after a forced reorganization of the RR, W. S. Saiter GM and lessee, with a rebuilding by 1883 noted (poss. the regauging and new rails). It is unfortunate that photos of the “Indian red” coaches have not surfaced and that news accounts, usually detailed, omitted much descriptive text! After years of financial upheaval, Poor's Manual of 1889 and local news items revealed many positive changes for the RR. The road was standard gauge, had six dummies (the original Porters RG?) and six coaches. By the end of the year, there were ten of these cars, open cross bench DT 32' types. The RR built these in its own shop (located on the square Customhouse, St. Patrick, Bienville, Olympia behind the Beauregard School), supervised by Capt. Alfred Bradley. The road's president, Mr. Charles Schiff, had his office in Cincinnati, Ohio. The 1890 Cincinnati city directory names him as President of the “C., N. O. & T. P. R. R. and Associate[d] Roads, (Queen & Crescent Route)”, and the 1891 city directory describes his railroad empire as reaching New Orleans via the Q&C-owned Alabama Great Southern and the New Orleans & Northeastern RRs, with his home in London, England. Frederick Knowland of N. Y. City “leased the NOSF&L and leaves running of trains to the NO&NE” (TD 3/10/1889). Knowland had a ten year lease of the Spanish Fort Hotel and grounds (from May 1, 1889 — TD 6/19/1889). The hotel's management was the Scott, Hagan & Co. of N. Y. City and a London, England director for the orchestra and casino gardens. As a unit, the RR and hotel was a first class institution. However, ill fortune, fate's curse, plagued the railroad. New Orleans suffered a record drought in 1891, and by fall much vegetation had died or dried out. On the first of September, sparks from dummy 6 set fire to grass, quickly igniting most of the crossties, leaving the entire 6.5 miles long RR's rails a twisted mass (TD 9/1/1891). No report on equipment loss. The 1891 fire didn't end the RR. The Queen & Crescent rebuilt it, continued passenger service, and in 1897 enlarged the Basin Street station (TD 7/8/1897). There was even a report that a portion of the road was considered for electrification (TD 12/15/1897). Accidents were another irritation. A year later (TD 9/27/1898) a switching crew managed to push a Missouri Pacific car, loaded with furniture, into the Basin Street depot, almost completely demolishing it, sparing only the ticket office and waiting area. One may wonder why the Queen & Crescent continued to operate the RR. The twentieth century's first decade provided the answer. The Q&C and Mr. Yoakum's Frisco System (allied RRs from Chicago to the Gulf of Mexico) revealed plans for a great terminal station at Canal & Basin (TD 3/16/1907). The Southern Railway, closely working with the Q&C, was also financially involved with the project, which “broke ground” per City Council ordinance NCS 1615 on June 4th (TD 6/14/1907). D. H. Burnham & Co. were the architects, James Stewart & Co. the contractor, and the $240,000 structure was “nearly complete...to open in 1908” (TD 1/20/1908). Owning the NOSF&L positioned the Q&C to move its station to Canal Street from the Press Street location, at least 35 squares below Canal Street. Thus, passenger service on the NOSF&L had to end. N. O. Judge Ellis ruled the road's franchise would be good until May 22, 1903 (TD 3/28/1901). The buildings and grounds at Spanish Fort, on March 25, 1909, were turned over to the N. O. Ry. & Lt. Co. (TD 3/26/1909), and the “Ry. & Lt.” Co. then sought and obtained an ordinance for an electric railway line to Spanish Fort, connecting with the company's West End line. Thus, the 1897 idea to electrify the NOSF&L — in just ten years — came true in a parallel effort. It is an unending irritation that photographs and full details of equipment continues to elude serious research. There are many sources of valuable research yet to be examined. Surely what rail historians want will be forthcoming. Operated pass. service to Chalmette in conjunction with NOSF&L RR. No data available on equipment, no P. NO&W leases NOSF&L RR 5/30/96, reorg. as New Orleans Belt and Terminal Co. 4/9/01. Sold 12/26/03 to New Orleans Terminal Co. (Queen & Crescent System). The Yoakum interests and the Queen & Crescent cooperated to build the “Terminal Station” at Canal & Basin, opened 6/1/08 (see S p. 103), soon handling Lou. Ry. & Nav. Co., New Orleans Great Northern, Frisco, and New Orleans & Northeastern (Queen & Crescent until 1917, bought by Southern Ry. Sys. ), plus the Chalmette suburban service, then operated by New Orleans Term. Co.
Sub'n service to Chalmette discontinued in 1920 — no details or P on eqpt. It is frustrating that so many of these operations are not illustrated by P, drawing, or sketch! Or even a verbal description. N.B. : Most railroads serving N. O. operated what amounted to sub'n service. The last was the Louisville & Nashville's Gulf Coast service which ended on May 6, 1964. ICRR tried GE gas electric car service to Kenner, but the Orleans-Kenner Elec. Ry. Co. (later Orleans-Kenner Traction Co., Inc.) interurbans drove them out of business (see S vol. 1). Also see S vol. 1 for streetcars across the river (Algiers); the N. O. & Lower Coast RR that almost was electrified, ran gas motors until late 1920s. The Y&MV had suburban trains N. O. to Sellers until 1931, with motors. T&P operated such a service Gouldsboro - Waggaman until 1919, with steam power. See S pp. 103-104. The NOGN, later GM&N, operated a N. O. - Slidell - Mandeville - Covington commuter service which it improved in 1931 with Brill gas elec. trainsets, light equipment, painted white with fine appointments, named the “St. Tammany Special” (it had a motor to Bogalusa in connection). This ended in 1938. It heralded the streamlined trains of 1934-35 such as UP's “Streamliner” and CB&Q “Burlington Route” famous “Zephyrs” with many to follow. The arrival of new intercity railroads to New Orleans, such as the NO&NE (eventually the Southern Ry. ), the predecessor of the L&N, the Texas & Pacific, and the IC subsidiary Y&MV required a belt line railroad encircling the Crescent City. The New Orleans & Western, later reorganized as the N. O. Terminal Co. as a part of the Queen & Crescent Route, later the Southern Ry. System, provided a back o' town connection between the T&P, MLa&T, IC, and Y&MV RRs and the L&N and NO&NE, with access to Chalmette's docks and steamship interchange. The question frequently was a topic of planning — a railroad paralleling the Mississippi River, serving warehouses, docks and industries, connecting the roads serviced by the NO&W. In 1904, under the administration of New Orleans mayor Paul Capdevielle, the New Orleans Public Belt RR was organized — a city owned railroad from the start, to be managed by a city commission of appointees. According to a 28 page brochure issued by the Public Belt in 1955, construction began in 1905, and in 1908 the railroad “began operations”. The first positive change the city saw was the removal of several RR switching and freight connection trackage in public streets, such as the long IC line in Louisiana Ave. to its connection with the IC RR back o' town. This was done with 20 miles of track. By 1955, double tracking, large yard capacity, and hundreds of leads and sidings saw total mileage at 153 miles, and NOPB averaged about 30,000 cars per month. Nineteen locos were on the roster: two 1200 hp, three 900 hp, two 800 hp, three 750 hp, six 660 hp, and three Baldwin 0-6-0 steam switching locomotives on standby. The road had just dieselized. It was employing 620 men in 1955. The NOPB owns and operates the Huey P. Long bridge across the Mississippi River at Avondale, built 1932-1935, connecting the Southern Pacific (MLa&T) and T&P with the railroads on the New Orleans side of the river. Gov. Long, later U. S. Senator, and New Orleans mayors and business leaders worked to get work started, receiving certificates of public necessity on December 3, 1930. A completion ceremony and dedication was held on December 16, 1935. The New Orleans mayor in office during the construction of the RR itself, following Mayor Capdevielle, was Mayor Martin Behrman (1904-1920), who served briefly in a second administration (May 1925 - January 1926). Following Behrman, mayors who supported bridging the Mississippi were Andrew J. McShane (1920-1925), Arthur J. O'Keefe (1926-1929), and T. Semmes Walmsley (1929-1936). There is no record of the NOPB owning any passenger equipment or offering public transportation service, although SP and T&P passenger trains ran over the Public Belt to reach their New Orleans stations. The SP trains used the bridge from the start, but the T&P did not begin to use it until 1942. This line connected Covington, Abita Springs, and Mandeville, in St. Tammany Parish on the north shore of Lake Pontchartrain, with New Orleans via lake steamships. At first a gasoline motor line, it was reorganized as the St. Tammany Ry. & Power Co. and electrified in 1915. It was abandoned in 1918 when the lake steamships were shut down. The history of the line is discussed in LaSR, vol. 1, pp. 122-129. Opening in 1915, the Orleans-Kenner Electric Ry. Co., the “O-K Line”, was a standard gauge electric interurban railway connecting New Orleans through Jefferson Parish to Harahan and Kenner, extending to the Jefferson-St. Charles parish line, along what is today the Jefferson Highway. It reached S. Rampart and Canal St. in New Orleans via trackage rights along the standard gauge St. Charles-Tulane Belt line. It was reorganized in 1918 as the Orleans-Kenner Traction Co. It was abandoned at the end of 1930. The line is discussed in LaSR, vol. 1, pp. 112-121. Copyright © 2014, 2016 Louis C. Hennick. All rights reserved.